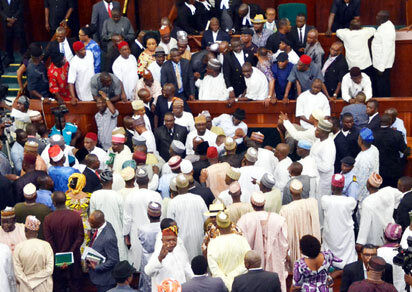 Members of the House of Representatives were sharply divided at plenary on Tuesday during the debate on the proposal seeking immunity for presiding officers of the National Assembly from criminal prosecution while in office. The bill, seeking an alteration of Section 308 of the 1999 constitution, as amended, provides for immunity for the Senate President, Deputy Senate President, Speaker, Deputy Speaker and presiding officers of state Houses of Assembly. The bill, sponsored by the Minority Leader, Hon. Leo Ogor, however turned plenary into a rowdy session with proceedings stalled for about 25 minutes. Ogor, who harped on the need to establish the independence of the legislative arm of government, argued that immunity would protect the presiding officers from unnecessary distractions. “We are all seeing what is happening in the Senate, with the Senate President and his Deputy,” Ogor said and added that if both presiding officers have to appear in court, the Senate would not be able to sit. His argument was buttressed by Hon. Ossai Nicholas Ossai who noted that the current constitution was produced by the military governments and therefore only takes the interest of the Executive into account. “It behoves on us, N’Assembly members, to protect the institution…When you protect the legislature, you protect the people, and it is the people who mandated the Executive to implement laws,” Ossai said.